Our taxonomy team has just completed the most recent addition to the WAND Taxonomy Library with the release of the WAND Legal Taxonomy. 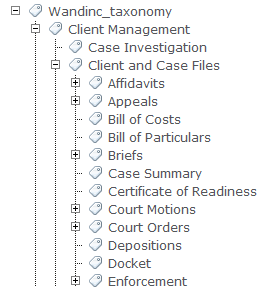 The Legal Taxonomy includes 745 terms, with 136 synonyms, designed to help a company or a law firm organize legal documents and concepts including matters, area of law, legal document types, and more. Adding relevant legal metadata to documents in your ECM system, be it SharePoint, Oracle UCM, OpenText, or any others that support taxonomy, is a great way to enhance and improve search inside of your organization. If you are a law firm or a legal department that is looking at creating an enterprise taxonomy, this taxonomy can dramatically increase the speed at which you can start.